Abrasion Testing Machine for Glazed Tiles - The ability of glazed tiles to resist surface abrasion encountered in every day use is determined by abrading the glazed surface either with a wet abrasive media consisting of steel balls of 1 to 5 mm diameter, aluminium oxide abrasive powder, and distilled water; or with a dry abrasive media consisting of porcelain cylinders and silicon carbide powder. The test is conducted by holding a number of test specimens on a flat horizontal disc. The disc is rotated at a speed of 300 rpm with the axis of rotation 22.5 mm out. This causes the abrasive load placed above the test specimen to rub over the surface of test specimens in a circle of 45 cm diameter. The abrasive load is kept in place over the test surface inside a rubber lined cylindrical metallic ring. The ring also keeps the test specimen firmly pressed against the metallic disc. 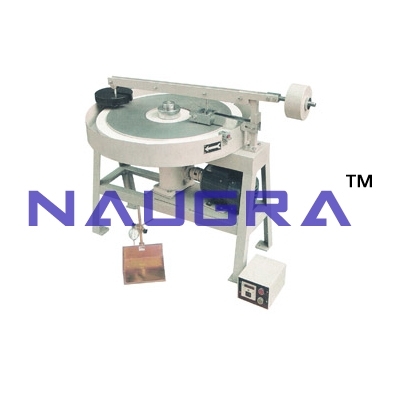 The Resistance to surface Abrasion tester for glazed tiles consists of a fabricated horizontal metal disc, a motorized arrangement to rotate the disc, a pre-set type electronic counter, nine number specimen holding ring for holding up to nine test specimens on the surface of the disc. The metallic disc is fabricated from mild steel plate. It can be rotated a vertical axis displaced by 22.5 from the centre of the disc such that any point on its surface traverses through a circle of 45 mm diameter once for each revolution of the disc. A counter weight is fixed on the lower face of the disc to balance the effect of vibrations set up due to its eccentricity. The disc is rotated at a speed of 300 rpm with the help of a motor and V-belt and pulley arrangement. A pre-set type electronic counter with key-lock reset and memory backup is provided to record the total number of rotations of the disc and also to switch off the motor after the desired number of rotations. The test specimens are held against the upper surface of the disc with the help of rubber lined circular rings and holding plates with cover which serve both to hold the test specimens and as containers for abrasive loads placed over them. Nine such holders are provided to hold up to nine test specimens over the disc at one time. The above components are mounted over a rigid metallic base. The equipment is finished in grey Hammertone stoving painting and bright chrome / Zinc plating to give it a corrosion resistant finish. 10 Nos. FLOAT GLASS OF size 100 x 10 x 10 mm thick are supplied with the equipment. Five sets of abrasive load for wet and dry abrasion are also supplied with the equipment. The components of wet and dry abrasive loads are also available as optional spares..
We are leading manufacturers, suppliers & exporters of Abrasion Testing Machine for Glazed Tiles. Contact us to get high quality designed Abrasion Testing Machine for Glazed Tiles for schools, colleges, universities, research labs, laboratories and various industries. We accept bulk orders for government tenders in all countries around the globe.